It has a 1/2" MPT thread on the back side, and a 3" face. Probe length 3 3/8". Note - This thermometer only reads Fahrenheit. Good reviews and reasonably priced. Nice markings, easy to read, right connection for my pot. I will be starting with a one pot system Brew In A Bag style so the reviews said this is a good all in one. Previously bought other thermometers and they were unreliable. Bought because of the quality that goes along with the name. I have only used this Thermometer once (Work and School don't really leave me much time to brew lately), but the maiden voyage was successful and accurate. I tested this against two other thermometers in boiling water and was only off +/- 1 deg. I plan on brewing again once the holidays are behind us and am looking forward to using this for maintaining consistent mash temps. 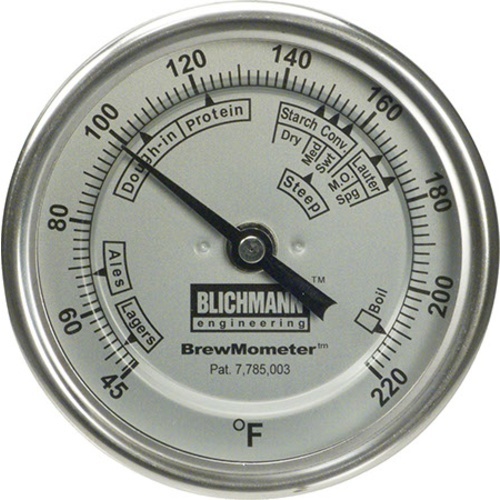 I would recommend this to accessory to any all-grain brewer looking to up their game in terms of accuracy and convenience on brew day. Perfect. Only drawback is the stem protrudes into the kettle fairly far, making it difficult to stir without hitting it. Picked this thermometer because of all the temperature markings for different stages of brewing. First batch was one pot extract and grain, but as I progress in in my brewing I will be transferring this to the mash ton. Great Thermometers. Easy to read dial face and the annotations are a good reminder. Exactly what I needed for my HLT. Great addition to my system! I use it on my Mash Tun, I like it so far. The descriptions under the temp ranges make it easy for beginners. I've used this on my 15 gallon kettle from morebeer and it is easy to install, clean, and read. The different temp zones is a nice reminder/guide. The 3 inch probe on the back is something to get used to when stirring your mash (to avoid hitting it). Friends love the easy to read temp. While I can't vouch for the accuracy of this thermometer I can say that the size of the bezel blocks my view of the temp unless I'm at about the same level as it. So if your brew pots are lower than waist height then you have to stoop down to get the right reading. On my two pots I went through 4 similarly priced dial thermometers. I had issues with fogging and even leaking (into the face) on all of them during their first use. The Blichmanns have performed beautifully through the last 5 brews. This is now my go-to dial thermometer, hands down. I've used this thermometer in three all grain batches and two extracts and it has worked well. I've tested the temperature on this thermometer and it reads accurately verses my two other thermometers. I really like the large dial and easy to read mashing and sparing areas. I use this in my keggle, works great. I put one of these on each of my keggles and they work great. I have whacked them several times with the mash paddle without incident. This is by far the best one I have used. Easy to install and very easy to read. Takes the guess work out of mashing.